Hindu ritualistic marriage is unique and has a special attraction in the foreign countries. This has become evident from the marriage of a Japanese couple who opted that their marriage be conducted in Odisha’s holy city Puri as per rituals of Hindu marriage. 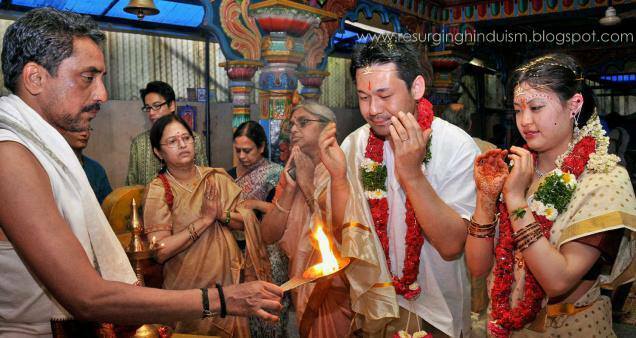 The marriage of Japanese couple Gino Naoki (Groom) and Gino Gunko (Bride) in Puri yesterday, 8 February 2012, was a special attraction for people of Puri, the holy city and the abode of lord Jagannath. As friends and relatives, more than 70 other Japanese, who came to attend the marriage ceremony, joined the procession and carried the groom to the marriage venue. The members quite enjoyed dancing to a few famous Odia folk songs and music. The marriage was conducted in Hotel Santana in Puri city of Odisha.